And he recounts some shameful statistics of our wasteful food culture: “One supermarket chain created 28,500 tons of food waste in just 6 months.” How many foodbanks would that stock? What kind of perverse economic ethic is it that obliges shops and supermarkets to incinerate perfectly edible food rather than alleviate poverty? Where is the moral compass of a so-called civilised society which binds responsible parents to enforced fasting in order that their children might eat? Such poverty is not only a present misery; it can have profound consequences on entire futures, for what hungry child can enjoy a game of football? How might they read a book or learn maths if their bellies are empty? What life-goals can they set if their thoughts are always on the next meal? The good people are surprised, they don’t remember helping anyone so powerful, and think He has mixed them up with someone else. Jesus tells them: ‘Just as you did it to one of the least of these… you did it to me.’ Those who did not give food to the hungry or a drink to the thirsty find out God has taken their lack of kindness into account too. And so it is, and so it should be. Christians are called to be compassionate toward the poor, not least because they had a privileged place in Christ’s ministry. The oppressed, miserable, dependent and humiliated are first in line for entry to the Kingdom of God. The poor, starving, homeless and sick cry out for social justice. We may cavil over definitions of ‘social’ or argue about the ontology of justice, but ultimately we are commanded to love them, and that must be expressed materially with prayer and thanksgiving. But the ‘Big Society’ is a work of fraternal benevolence and cooperative community, made up of kind and humane individuals working for the common good. By calling for the establishment of a new network, ‘Feeding Britain’ – which is to made up of foodbanks, charities, the food industry, and no fewer than eight government departments – you considerably expand the Welfare State and nullify the need for the Big Society: acts of charity such as the distribution of free food are conceived as a coercive government responsibility rather than organic expressions of altruism. The primary task of government in the process of food distribution is to ensure adequate supply and the functioning of a free and fair market which transcends narrow self-interest and recognises those in need. That is to say, government must encourage wealth creation and gainful employment in order that people might participate fully in society and eat. There can be no underclass without the purchasing power for basics such as food. And that brings us to the price of bread. 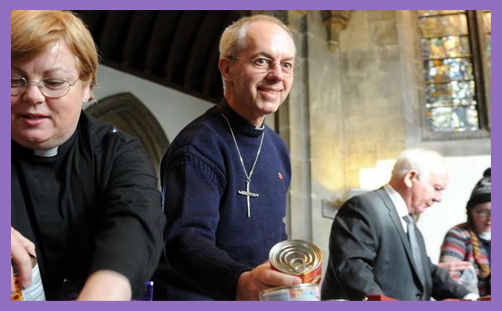 In all the episcopal pleas for the Government to alleviate poverty and “do something” about the seemingly inexorable rise of foodbanks, none of them – not even Archbishop Justin – ever refers to the distorting market effects of the Common Agricultural Policy – the CAP – which inflates our food prices by around 17% through a plethora of undisclosed tariffs, unknown subsidies and a bewildering array of production quotas. This is effectively an EU food tax, imposed bureaucratically and collected centrally for the benefit of farmers and other agricultural producers who are paid not to feed Europe, but very often to leave their fields fallow and their harvests to rot. The CAP is so complex that it is apparently unreformable – successive British governments have been trying for the past 30 years, all without success. But what is certainly known is that it makes our food more expensive. Just compare the prices of bread, meat, fish, vegetables and fruit in the USA to those in your local Sainsbury’s, Asda or Lidl. Market conditions are variable, of course, and costs naturally fluctuate, but world food prices are so manifestly and consistently cheaper than those in the UK and the wider EU, and the sole reason for that is the CAP. Wouldn’t those families who are humiliatingly forced to visit foodbanks benefit from a weekly grocery price cut of 17%? Is the CAP so hallowed that it blinds our bishops to its immoral inflationary effects? Is our membership of the EU so sacrosanct that even the Archbishop of Canterbury cannot see that it sustains policies which damn the poor to concentric circles of poverty, and cloaks debt, hardship, scarcity and bankruptcy in vacuous anthems to peace, justice and unity in diversity?